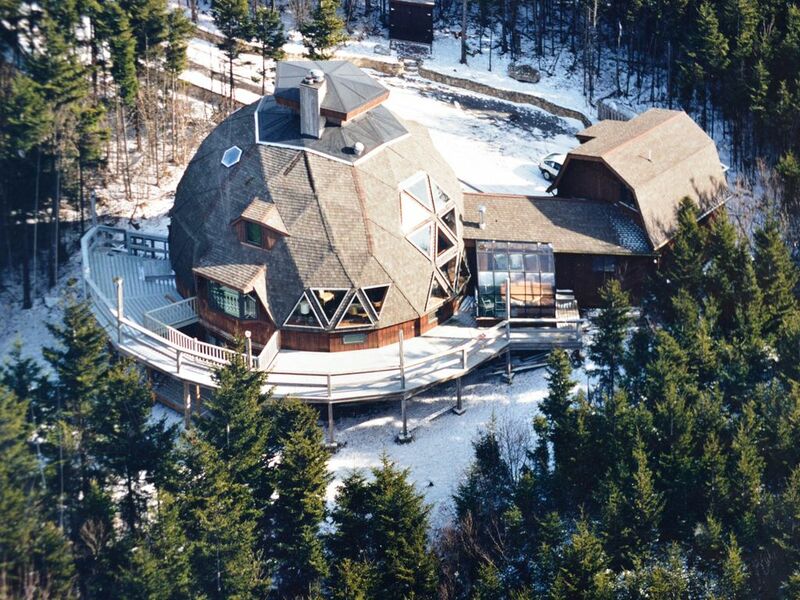 The Paine Family Geodesic Dome is located within walking distance of both the Village and the Soaring Eagle Lodge. The slopes at Snowshoe Mountain are easily accessed from the Dome, so that guests can stop in for lunch, take a Hot Tub and then head back out and enjoy the rest of the day. A free shuttle service (The Hare Line) runs regularly and passes directly in front of the residence. This enables guests to travel anywhere within Snowshoe Mountain Resort including adjacent Silver Creek Ski area. The structure itself is remarkable , especially the Great Room with its curved interior walls, huge triangular windows and massive stone fire place. The bedrooms offer similar unique and cozy living spaces. The bottom floor apartment can be effectively used as a separate living area if more privacy is desired by someone in the group. Internet service is available along with a stereo system that can be hooked up to your smartphone. There are also two televisions and a house phone and a Keyboard, in case the guests are musically inclined. During the summer, Snowshoe spent millions in snowmaking upgrades, specifically in the Western Territory. New high tech snowmaking machines were placed all along Snowshoe's legendary Cupp Run. Snowshoe used the guns they replaced on Cupp Run to upgrade the adjacent Double Diamond Shay's Revenge snowmaking system. The result? Better snowmaking capabilities on both slopes, raising the possibility of opening the Western Territory as early as December 10th, if weather permits. In any case both 1500 foot vertical slopes(most vertical till you get to New England or the West) will have awesome new snowmaking capabilities which should mean earlier openings and later closings for these two premier pistes of West Virginia. What else? This season Snowshoe introduces a new 10 acre Freestyle Terrain park called Evolution on the slope formerly known as Yew Pine. This complements the already existing, Progression Freestyle Park which offers smaller features. Or guests could choose the easily accessed Mountaineer freestyle park with more challenging features at nearby Silver Creek Resort. What's more Snowshoe has added another beginner slope to more easily access upper Whistlepunk which is a nice addition for new skiers. Silver Creek Resort also upgraded their snow making capabilities and used the parts of their old snowmaking system to upgrade their Mountaineer freestyle park. Also, Snowshoe added another tree skiing area between upper Shay's Revenge and Cupp Run called Sunset Glades. This is in addition to the 'Glade Skiing' area of Knotbumper and Sawmill Glades that currently exist at Snowshoe. When heavy snows come, these areas are well worth exploring, if guests have enough skiing skill...after all, there are some trees involved. The Skiing at Snowshoe is awesome and the Warm Season has its attractions as well including Downhill Bicycling with lift access, the Raven Golf Club, fly fishing, hiking and about anything else you can think to do in the summer. Dr. Jim Paine Sr. built this Geodesic Dome, following the design of famed architect Buckminster Fuller https://en.wikipedia.org/wiki/Buckminster_Fuller, in 1983. Jim and his wife Bea, who live in Bluefield, West Virginia were among the original investors in Snowshoe in 1974, the year the resort first opened. Unfortunately, Snowshoe went bankrupt that first year so that investment was lost. Never mind, the real dividend was the skiing and the Paine family has been skiing there ever since. Guests will notice many family photos documenting the long skiing tradition of the Paines. Enjoy this unique space. There is something about being inside the Geodesic Dome that brings a sense of serenity not found anywhere else on the mountain. Easy Access to Slopes...Leave skies slope side, come back to the Dome--Warm up in the Hot Tub-Have some lunch--when properly fortified, Head back to the Slopes! Easily workable and heats too! The Great Room is a fine place to gather-stoke the fire- and have fun! Brand new this season--seats six. Big house, lots of space... it was like staying in Ron Burgondy's ski house :) John the property manager was very helpful. Has a lot of character, a bit worn out and could use a deep cleaning. Our group of 13 people (2 children, 5 teens and 6 adults) fit great in this house. I was a little worried b/c the description lacked a little info, but I am guessing it is 3000sq ft +, it had 6 bedrooms, which were normal snowshoe sized or larger. It had 3 living areas!! and 2 kitchens- both with full sized fridges. A few of the teens just slept on couches in the living areas so they didn't have to share a bed. I was worried about the beds after seeing the green carpet in the pics, but the beds were pretty good for a rental. I loved the atrium to put our snow jackets and gear and the hot tub room was fun. You have to hike across the road to get to the slopes (across the street from Loggers Run), but it isn't any further than trekking across the parking lots of Black Bear Crossing to get to the slope. And, plenty of parking. I liked that we were not on top of other units/renters. There is an apartment over the garage that is used by the owners son (daughter was there filling in for him as postmaster of Snowshoe). They are super nice,and we hardly knew they were there. We have stayed in probably over 6 different complexes at Snowshoe, and we will be back to this house for sure! Thank you for sharing your home with us. This house was great for our large group of friends! Plenty of rooms and beds for all of us! John was very helpful and accommodating. Great location - walking distance to the slopes! Wifi is a little spotty and there was very little phone service at the house and on the slopes. But we loved it and are already planning our trip back there next year! Love this place. Second year in a row, can't wait till next year. We had a wonderful time. Plenty of beds and bathrooms, loved the large kitchen table for games, Could use a TV in the main living area, wifi needs updated, fireplace needs written instructions, John was very helpful, parking was ample, location was awesome. Indoor hot tub was a nice feature but could use more air circulation. The house was dated but adequate and we made many family memories. Loved the homey feel, and enjoyed all the family pictures on the walls. We had a fabulous time and would recommend this to families.